Help your kitty be his best self with the Feliway Travel Spray On The Go Management Behavior Modifier Spray. When a cat feels comfortable in their environment, they rub their cheeks against objects like the wall or furniture, leaving a facial pheromone behind. This spray mimic that same natural scent, which helps prevent cats from acting out whether you’re on the road or at home. 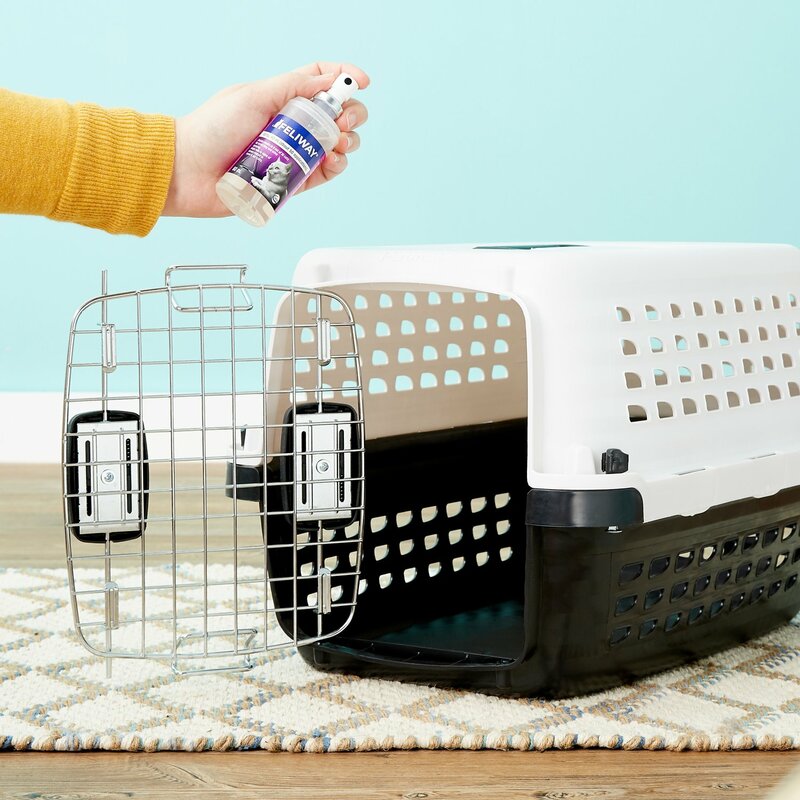 Spray it in carriers on the way to the vet to calm his nerves and soothe aggressive behavior, or even use it in the home to reduce scratching and spraying. It’s like breath of fresh—and familiar—air for your anxious kitty! Behavior management spray mimic a cat’s natural facial pheromones, which creates a state of familiarity and security. Veterinarian recommended to help prevent or reduce stress and help cats cope with bad behavior triggers. Spray in the carrier or on other hard surfaces during travel to reduce aggressive or unwanted behavior. Clinically proven formula is also great for use in the home "detractant" to eliminate spraying and scratching. Simply spray 8-10 pumps on doorways, cat-flaps, furniture and other objects cats may be tempted to mark. Feliway should never be sprayed directly on the cat. Synthetic analogue of the F3 fraction of feline facial pheromone 100 mg/mL in 89.2% ethanol. Spray 8 to 10 pumps of Feliway 15 minutes before the cat is introduced into the sprayed environment (car, carrier, bedding, table for medical examination, etc.). Effects last approximately 4 to 5 hours. Re-apply as needed or if you notice a reduced effect. 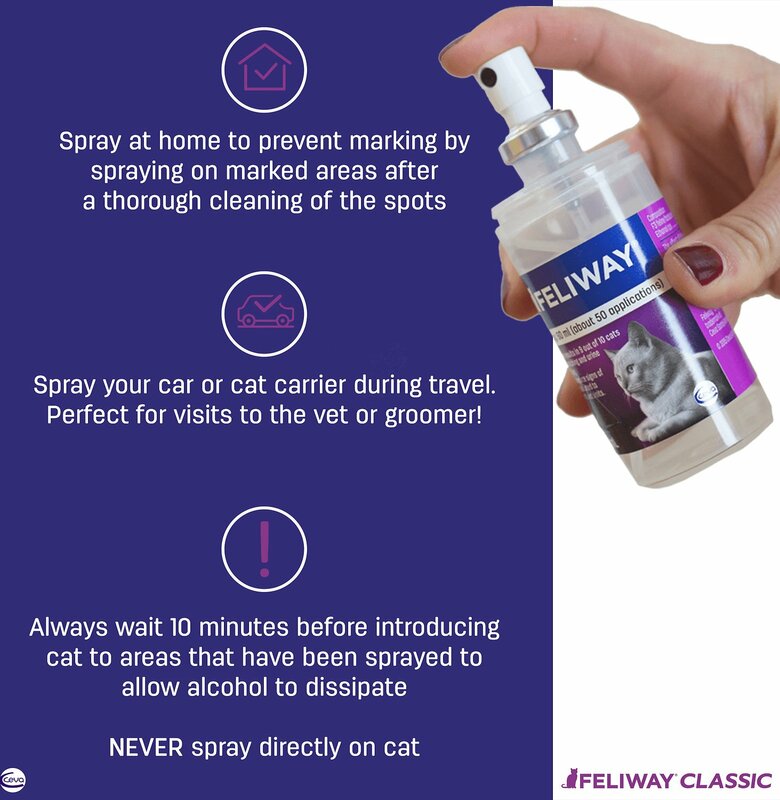 Feliway Spray can be applied directly on bedding, inside the carrier, or in the car, but be sure to apply without the cat in the area to be sprayed (particularly inside the carrier). Feliway Spray should not be sprayed directly on animals or near an animal’s face. Maybe I Expected Too Much! I purchased this Feliway spray at the recommendation of a friend. I needed something which would help to calm my cat so I could cut her nails. I read numerous reviews ... most were very favorable. My cat, not only doesn't like the fragrance, she will not stay in the area that has been sprayed. I have never seen any change in her demeanor after using it. I suppose it is like introducing your cat to catnip. Some cats go absolutely crazy while others are not affected in the least. I've been using this spray in my cat carriers for years now but the price and convenience at Chewy makes it even more attractive. I periodically spray the carriers with Feliway (I leave them out and open like dog crates so the cats can sleep in them and find them less threatening when I need to take them to the vet) and almost always right after I spray I find one or both of them snuggled up in the carrier snoozing peacefully. It helps a lot on the way to the vet too. Once they get in the car they calm down. Great stuff!! I have 6 older cats who were starting to act up with marking and urinating in various places around the house. It was driving me nearly insane with constant monitoring and cleaning. I sprayed Feliway in a few places that were favorite spots, and it's like a miracle. Knock on wood, but the problem is gone. On my fixed income it's a little expensive, but I certainly will never be without it. I can't believe the difference! I have a tiny (5 lb) formerly feral cat that becomes a saber-tooth ninja assassin when it becomes time for vet visits or medication. Seriously the vet techs wore gloves like people that have to deal with rabid raccoons wear! We have scars from moving a couple years ago, she’s a whirling dervish of razors and pain when she’s scared. BUT spray this in the carrier and on a towel at the vet and she calms right down and is a super sweetheart. I literally wondered how the vet performed an exorcism on her in mere moments and it was Feliway spray. When I said I’d try anything to make things easier for Pikachu and it was a Chewy order away. I can’t recommend trying it enough. 2 of my 5 kitties have developed idiopathic cystitis from stress/ anxiety (new kitty addition to household) this in addition to Vet care for the 2...seems to help keep them all be calmer...I've bought several bottles and spray near litter box and on/ near inappropriate peeing spot..litter box kept in closet (I spray entrance and walls above box and hallway...i keep away from electrical outlets because it's flammable) instructions say 8 sprays per area ,last 4-5 hrs but I just use once in morning, once at night..i have been using this classic feliway product for years whenever I introduce a new kitty. This helps my kitten not freak out in her carrier when we’re traveling. She still cries a bit, but what was sheer insanity (level 10) is now a 3. Thanks goodness for this spray! I doused her carrier in it. So far there has been little noticable effect but I am continuing using it in the hope it will calm down my new cat's hostility to my other cat that I've had for 10 years. I bought this for my scaredy cat Jade, who doesn't like people besides me, and hides from the other cats in the house. She also doesn't like getting pet much. I sprayed it a couple times in her location yesterday and today and just like that she's a different cat. She came out today and wanted attention 3 different times. I'm so pleased with the results! I hope it keeps working. She seems so much happier.